From L to R: Senate President Pro Tem Phil Berger, Gov. Roy Cooper, House Speaker Tim Moore. Just hours after North Carolina Republicans released their $23.9 billion state budget, a key state House committee signed off on the spending proposal Tuesday afternoon over the objections of angry Democrats. Tuesday’s “up” or “down” vote on the budget conference report, which did not allow for amendments, clears the budget plan for a full chamber vote in the coming days. 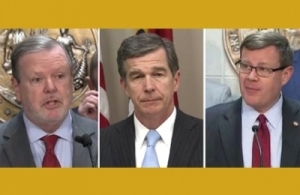 It’s an unprecedented, controversial process for the state budget, one that has prompted sharp rebukes from minority party leaders in Raleigh, as well as Democratic Gov. Roy Cooper. “You wonder how our colonists felt with the king of England. We now know,” House Rep. Billy Richardson, a Fayetteville Democrat, told reporters Tuesday. “I’m having problems reconciling right now whether I’m in North Carolina or North Korea,” added Rep. Mickey Michaux, a longtime Durham Democrat. House and Senate budget committee members held a joint meeting on the plan Tuesday morning, although it did not require a vote from the Senate committee under their chamber’s rules, legislators said. Republican leaders in the House and Senate negotiated the spending package behind closed doors, and appear poised to approve the budget this week with a minimum of debate. The Senate is expected to debate the budget proposal Wednesday morning, with House lawmakers likely to take it up Thursday and Friday. “Fiscally responsible, pro-growth policies have allowed (the state Senate) to come to a budget agreement with the House that invests additional money in public education, increases pay for teachers and state employees, and provides tax relief for millions of North Carolinians,” Senate President Pro Tem Phil Berger, R-Guilford, Rockingham, said on Twitter Monday. Democrats held a press conference Tuesday afternoon to roll out their would-be budget amendments, claiming their party would have sought larger teacher raises, more funding for early childhood education, environmental mitigation dollars and more. Jackson added that he believes the GOP opted for the conference report process, which some Republicans lauded as more “efficient,” because they were “scared” to vote “no” on Democratic amendments to teacher pay and the environment. “It’s clear that the Republican legislature continues to leave veteran teachers and public education behind in order to protect their tax breaks for corporations and people making over $200,000 a year,” Cooper spokesman Ford Porter said in a statement late Monday after the spending plan was released to the public. GOP lawmakers, however, touted the proposed budget as a major investment in education, speeding an average 6.5 percent pay increase for teachers, principal pay raises, funds for “enhancement” teachers in the arts, as well as millions in school safety projects cleared by a legislative committee this year after a deadly school shooting in Florida left 17 dead. Tuesday’s frantic budget activity comes days after 20,000 to 30,000 teachers and public school advocates swamped Raleigh to demand a greater state investment in schools. The N.C. Association of Educators (NCAE), an organization that lobbies for teachers at the General Assembly, organized last week’s rally. NCAE President Mark Jewell issued a statement quickly after the spending plan’s release, slamming GOP budget-writers for their process. Republicans also dismissed calls to nix tax cuts for corporations and individuals. Critics say the cuts drain billions in state revenues every year that could be spent on public schools. “We will never catch up if we continue to prioritize tax cuts for corporations over teacher pay,” said Rep. Susan Fisher, an Asheville Democrat. Policy Watch is still analyzing the massive budget document, but see below for North Carolina public school highlights in the GOP-authored budget, which is all but certain to pass in the Republican-dominated legislature. Keep checking back for updates. Spends an additional $11.8 million on teacher salaries, enough for an average pay increase of 6.5 percent, according to Republican lawmakers. That’s slightly higher than the 6.2 percent increase Berger and Moore promised days ago, and includes raises for some of the state’s most veteran teachers. Republicans have been criticized in past years for focusing raises on beginning and mid-level teachers. Cooper’s plan would have cleared an average 8 percent raise for teachers. Cuts a $5 million veteran teacher bonus program, in exchange for veteran teacher raises. Allows North Carolina cities to use property tax revenues for education. This is a major policy change for the state, drastically altering the mix for local district funding and—most notably—clearing one major hurdle in a controversial “secession” push for Matthews leaders who want to open their own charter apart from the Charlotte-Mecklenburg Schools system. As Policy Watch has reported, the proposal’s spurred numerous questions about precedent and segregation. Spends $12 million on principal pay increases. North Carolina lawmakers have been addressing principal pay after the state’s ranking fell near the bottom of the nation. Includes a rather large number of grants for local K-12 projects. Of particular note, the budget includes a $200,000 grant for Donors Choose—a crowd-sourced, fundraising program for school initiatives—to support classroom supplies in certain Charlotte schools. This odd and narrowly-tailored provision would seem to directly benefit schools in Republican Sen. Jeff Tarte’s district in Mecklenburg County, according to a report Tuesday from The Charlotte Observer. Includes a relatively modest, but perhaps precedent-setting, $25,000 grant for a Burke County charter school to build new classrooms. Historically, the state has stayed out of funding the capital needs for charters, much to charter backers’ consternation, but this provision would put money into the infrastructure for the New Dimensions Charter School, part of a growing TeamCFA charter network that’s been heavily involved in lobbying for school choice programs at the state. Reallocates millions in non-recurring funding from the state’s Indian Gaming Education Fund to offset budget reductions for textbooks and digital resources. The state’s per-pupil allocation for textbooks will be unchanged from the 2017-2018 budget, despite long-running criticism from school advocates who say North Carolina textbook funding falls far short of the state’s need. As promised in this year’s class-size compromise, the state legislature will spend $61.4 million in 2018-2019 to implement some of the K-12 needs created by their controversial mandate to chop class sizes in the early grades. One key point, however, is that school districts face more than $8 billion in school infrastructure needs that are only compounded by the class size mandate. Lawmakers agreed to funnel more than $42 million of non-recurring funds into a need-based school construction fund for economically distressed counties, although that represents just a fraction of the state’s need. Spends $22.9 million on GOP-favored performance bonus programs for teachers whose students excel on standardized testing for math and reading. Despite dismal academic scores, the budget would grant another four years to two for-profit companies running virtual charter school programs in North Carolina. The program’s come under heavy fire from public school advocates who point to shoddy results in other states. Gives a boost to per-pupil allocations for children with disabilities and academically gifted children. Sets aside $3 million for the N.C. Department of Public Instruction to cover costs, including severance payments and contract renegotiation, associated with the recommendations of a controversial, GOP-ordered audit this year. Authorizes the Innovative School District to run schools in the controversial takeover district, in the event of a contract termination or if the state can’t find a “qualified” operator. This comes after this year’s search for an operator left many questions about the chosen nonprofit’s experience and capacity. Some also questioned the optics of the deal, which involved an ex-state lawmaker who spearheaded the program’s creation. Expands the number of school systems that can participate in a new tuition reimbursement pilot program aimed at teacher assistants. Extends a pilot programs for advanced teaching roles by five years.